In stock 98 items in stock. We carry this same display in yellow, green, and blue. You can't use this display directly with I2C since it doesn't have a controller built in. It's just a bunch of LEDs arranged to make four digits. 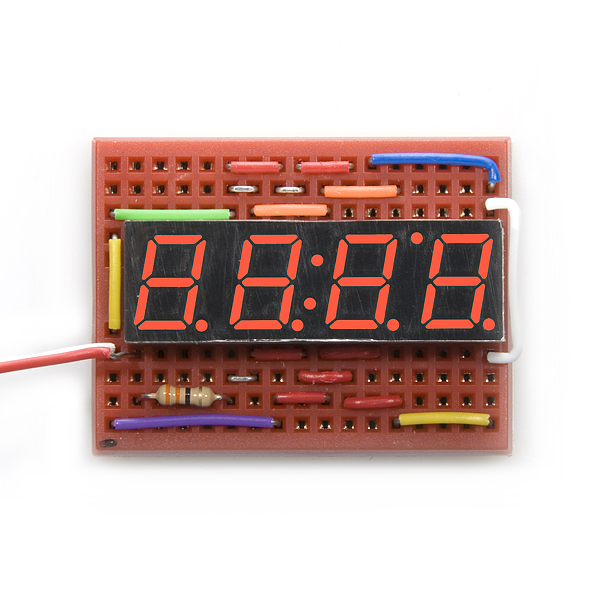 If you want I2C control, our 7-Segment Serial Display is what you want. It has a controller built in that lets you use I2C, SPI or TTL serial. In other examples I saw people put the digit they want to display high and then the A-G parts they wanted to display high also. But that doesn't work for this display. The digit to display must be set to high. But you can either set the A-G parts to low or to toggle them between input and output (where input means on) to display them. I was unable to find any examples online of this display being used. I just received a blue (3.4 VDC) and a yellow (2.1 VDC) one of these. I'm not sure how to go about hooking them up to an arduino. I think the answer lies in your post above, but being the n00b that i am, i'm still unsure about what to do. Can you please describe in more detail or provide some sample code? how do i vary the voltage depending on the 2.1 V or 3.4 V version? 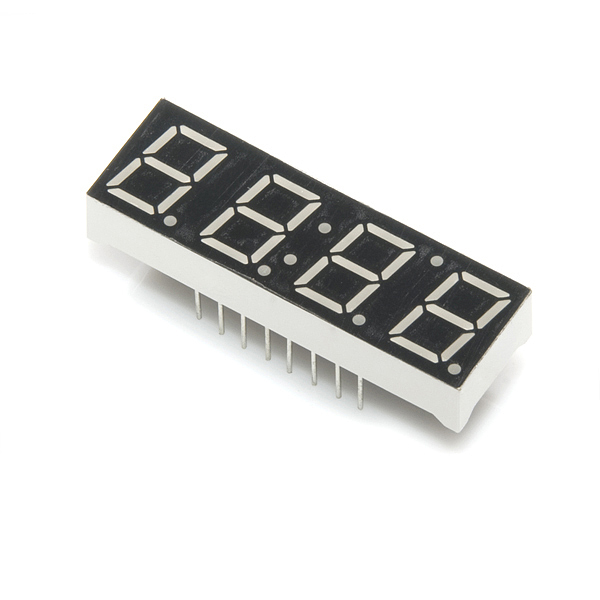 These are common anode displays, therefore you have to pull the A-G pins low to turn them on. what is the lead diameter on these things for PCB layout? Didn't see it in the spec . . .
maybe i'm blind, but I cannot find an explanation of what pin is what for the life of me! I understand that of the 16 pins, 8 are the 7segments abcdef+decimal, 4 are the digits, 1 is the colon, and 1 is for ground i guess? but which pin is what! if anyone could direct me to an image that made this clear i would really appreciate it! 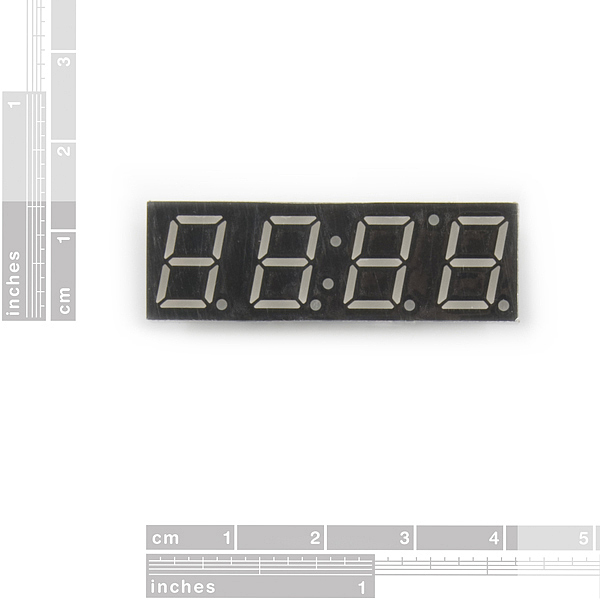 It's tricky to see, but if you look at the back of the display, through the clear epoxy, to the little circuit board within, you should be able to make out a "1" by pin 1, and a "16" by pin 16. These follow the normal IC numbering convention of increasing counterclockwise when viewed from the top of the device. 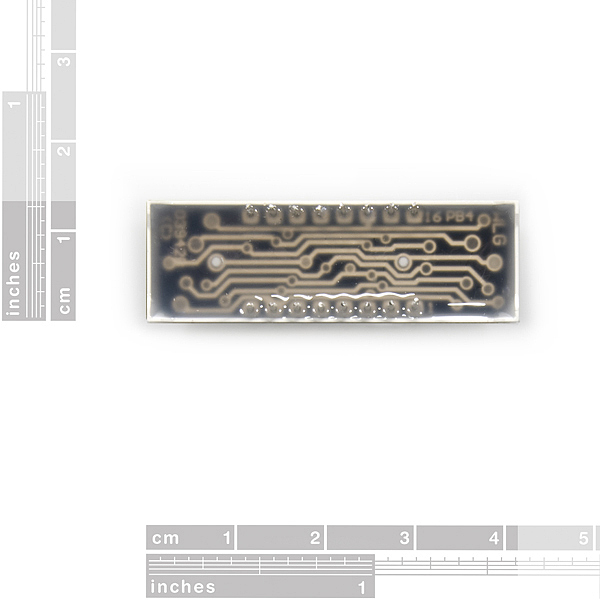 Once you know the numbers, the datasheet has a diagram showing which pins go to which segments. Let us know if you need further assistance! How do i control different digits displaying different things? I can only have the light up digits say the same thing. Micros do this so fast you cant even tell when they are off so you'll see all the digits on with diferent numbers. One of the LEDs on mine doesn't work. Look for a multiple-digit LED display driver chip to make driving these easy. Maxim makes the MAX7219 and MAX7221 that do this (http://www.maxim-ic.com/quick_view2.cfm/qv_pk/1339). oops, just realized these are common-anode. So the ICM7218 or ICM7228 may be better even though the maxim chips have more functionality. I've used an ICM7218A as IsotopeJ suggested and it works fine. And combined with a PCF8574 you only need 2 pins from the Arduino to control 2 displays.